It was certainly a busy week for MEPs at their first plenary sitting since the summer recess. 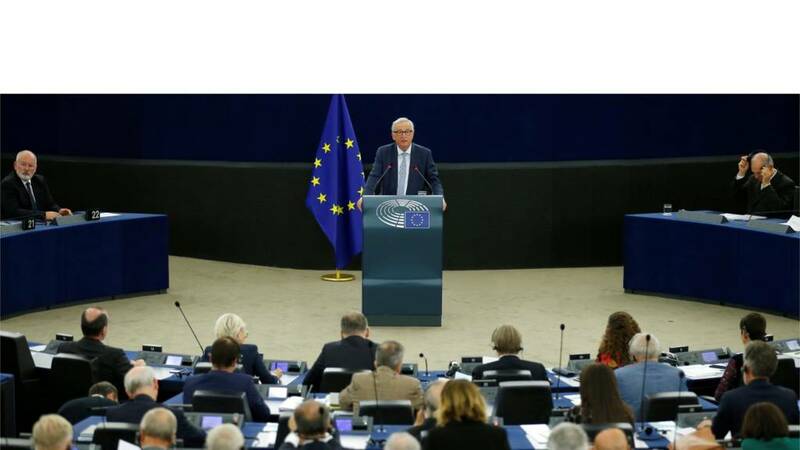 The centerpiece came on Wednesday morning, when Jean-Claude Juncker made his last 'state of the union' speech as president of the European Commission. He pledged a boost to the EU's border and coast guard, proposed a new EU partnership with Africa and renewed his call to abolish unanimous voting for certain foreign policy decisions. There was much talk of unity - but Wednesday also revealed the deeper fissures within the EU, as MEPs voted to reprimand Hungary for allegedly breaching the bloc's values. For the first time, they called for disciplinary action to be taken against the country under Article 7 of the EU's treaties. But actually imposing sanctions is a long and difficult process. Defending his government ahead of the vote, Hungarian Prime Minister Viktor Orban said the vote was an "insult" to his people and vowed not to be "blackmailed". MEPs also finally agreed to largely back controversial changes to EU copyright rules when they agreed their negotiating position on the changes ahead of talks with member states. Critics insist the drafting of the law poses a potential threat to freedom of expression online - expect to see more on that as the legislation progresses. With that, today's voting session comes to an end. There is just one short debate this afternoon, tabled by the liberal ALDE group, on making Europe Day - 9 May - a EU-wide bank holiday. However that's where out coverage of this week's plenary sitting comes to an end. MEPs will next be back in Strasbourg between 1-4 October. They also back another non-binding report advocating greater restrictions on the sale of antibiotics. The report says the EU states and the European Commission should work to reduce incentives to prescribe antibiotics, and calls for their use on animals to be banned. Antibiotics have been used to treat bacterial infections for 70 years but are becoming less and less effective, partially because of their widespread use in farms. The use of certain antibiotics, it says, should be reserved for the treatment of humans in order to preserve their effectiveness “for as long as possible”. MEPs back an advisory report from the environment committee on the EU’s strategy for reducing plastic waste launched earlier this year. The report advocates a ban on micro-plastics in cosmetics and cleaning products by 2020, and calls for new EU-wide standards for biodegradability and compostability. A plastics strategy launched by the European Commission earlier this year would mean all plastic packaging should be designed to be recyclable or reusable by 2030. That’s the speech from Macedonian Prime Minister Zoran Zaev finished. MEPs are now taking their seats for today’s voting session. Macedonian PM Zoran Zaev tells MEPs it feels "natural to be here" amid our "European family". He says the referendum on the deal is "not an easy decision" but says backing the deal is a "once in a lifetime opportunity" for his country. "This is our ticket for entering the European Union and Nato," he says. He says his country is "fighting not to be isolated from the rest of the world", and pushing to be a "respected member of the international community". He says the importance of the referendum is on a par with the country's 1991 plebiscite on independence. After 27 years of talks - and many protests - they have settled on the formal name of Republic of North Macedonia. It had vetoed the neighbour's bid to join Nato and the European Union. That’s the debate on this month’s human rights motions finished. They will be among the items put to a vote during the voting session later. First though MEPs will be hearing a speech from Macedonian Prime Minister Zoran Zaev. In June Macedonia signed a deal with EU member Greece that aims to settle a decades-long dispute over the country’s name. Under the deal, which faces a referendum vote later this month, the country will henceforth be known as North Macedonia. Heated rows over Macedonia's name have been running since the break-up of the former Yugoslavia and have held up Macedonia's entry to Nato and the EU. The third and final motion calls for charges to be dropped against Cambodian opposition leader Kem Sokha, who was unexpectedly released from prison this week. Mr Sokha has been released on bail but faces restrictions on his movement and communications, his family says. He was arrested in 2017 in a case widely seen as politically motivated. His party was subsequently dissolved and with no political opposition left, the ruling party won a landslide election victory earlier this year. MEPs’ draft motion says the Cambodian government should allow Mr Sokha, who suffers from high blood pressure and diabetes, to receive medical treatment. EU foreign policy chief Federica Mogherini says the European Commission has already called for the journalists to be released "immediately and unconditionally". The Commission has followed their cases closely and has "continually raised" them with the authorities in Myanmar, she tells MEPs. The case has been seen as a test of press freedom in the country, she says, adding: "It is pretty clear that the test was failed". She says the Commission has made clear to Myanmar that its trading relationship with the EU is based on rights commitments and "decisive action to improve the situation" is required to preserve this. She also says the Commission is considering "strengthening" sanctions against military figures in Myanmar following action in June. The second motion calls on Myanmar to immediately release two Reuters journalists who were sentenced to seven years in prison earlier this month. Wa Lone and Kyaw Soe Oo, nationals of Myanmar, were sentenced for violating a state secrets act while investigating violence against the Rohingya minority. They have maintained their innocence, saying they were set up by police. Myanmar's Aung San Suu Kyi has defended their jailing, despite international condemnation. The draft motion says the sentence “further undermines freedom of expression, democracy and the rule of law in Myanmar”. The first motion calls on Uganda to drop charges against Ugandan MP and pop star Bobi Wine. He, and 32 opposition politicians, were charged with treason last month over the alleged stoning of the Ugandan President's convoy during a by-election last month. Bobi Wine arrived in the US for medical treatment earlier this month after being granted bail, following accusations he was tortured and beaten while in military custody. A draft of the motion supported by six of the assembly’s political groups says the charges “appear to be trumped-up” and accuses the government of a “crackdown” on opposition politicians. It calls on the EU to use the “political leverage” provided by its aid donations to Uganda to promote human rights in the country. That’s the debate on food quality for branded foods finished. Next there will be short presentations of this month’s three human rights motions, which will be put a vote later this morning. Health and Food Safety Commissioner Vytenis Andriukaitis says people in the EU should get "equal access" to high-quality products regardless of where they live. The European Commission is co-funding food tests and providing "concrete guidance" to national authorities on relevant legislation, he says. It is also providing a "harmonised methodology" for testing as part of an EU-wide campaign which will provide better information on the scope of the problem, he adds. He calls on MEPs to back the Commission's proposed revision of commercial practices legislation before the European elections next spring. Next MEPs are debating a report from the internal market committee with recommendations for standardising food quality for branded foods across the EU. Politicians from a number of ex-communist countries have complained that certain brands have been using inferior ingredients in products packaged identically there. The report recommends that products containing different ingredients should not be branded identically across the EU. MEPs also recommend greater sharing of product information between countries and backs European Commission plans to revise the EU’s unfair commercial practices directive. French centre-right MEP Angelique Delahaye says the EU cannot expect its farmers to be the "best pupils in the class" whilst food imported from elsewhere fails to meet the same standards. Belgian liberal Frédérique Ries says the current system is "not applied properly by most states". The emergency procedure is abused, she says - and the EU's so-called precautionary principle is often not applied. Green MEP Molly Scott Cato says the current approvals process is "dictated" by large agri-food firms and calls for a move towards more sustainable farm management. The environment committee report expresses concern that the EU’s current authorisation rules have not been effectively implemented. It also says the emergency authorisation procedure has been misused, and calls for the procedure to be simplified to avoid deadlines being missed. The authorisation system, it says, must be based on peer-reviewed evidence and should bear in mind how pesticides are used in practice. It also calls for the transparency of the authorisation system to be improved in order to “encourage public confidence”. Irish Fine Gael MEP Mairead McGuiness says politicians should be mindful of what the alternatives are to products that they call to be banned. They have so far "failure to reassure" farmers that they "have them in mind" in the authorisation procedure, she adds. Austrian social democrat Karin Kadenbach says it is clear the current procedure has "serious shortcomings". The system has a number of exceptions, including a fast-track procedure that allows some banned products to come back onto the market, she tells MEPs. Hello and welcome to coverage of the final day of this week's plenary sitting of the European Parliament in Strasbourg. First this morning, MEPs are debating a report from the environment committee which proposes a review of the EU’s authorisation process for pesticides. It follows controversy last year over the renewal of the licence for glyphosate, a weedkiller widely used by farmers. One UN study called the chemical "probably carcinogenic", but other scientists said it was safe to use. In December EU countries voted to renew its authorisation by five years, although nine EU countries voted against. France plans to ban the use of glyphosate within three years.